Today our Holy Father Pope Benedict XVI, now gloriously reigning, celebrates his 85th birthday, and on the 19th April he will celebrate the seventh anniversary of his election as Supreme Pontiff. Congratulations Holy Father, and long may you reign! Don’t forget to include the Holy Father in your daily prayers, God strengthens the sheep by strengthening the shepherd! 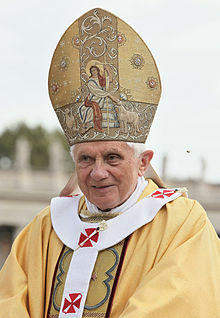 V. Let us pray for Benedict, our Pope. flock committed to him, may he attain everlasting life.